Another week down! I decided to mix up my meals for this week. Breakfasts are eggs baked in turkey cups - I found the recipe on Pinterest and managed to find Whole 30 compliant turkey at the grocery store. Forgot to take pictures, though - but I'm sure make more next week, they're pretty good. For lunches, I baked chicken thighs that I sprinkled with black pepper and paprika. 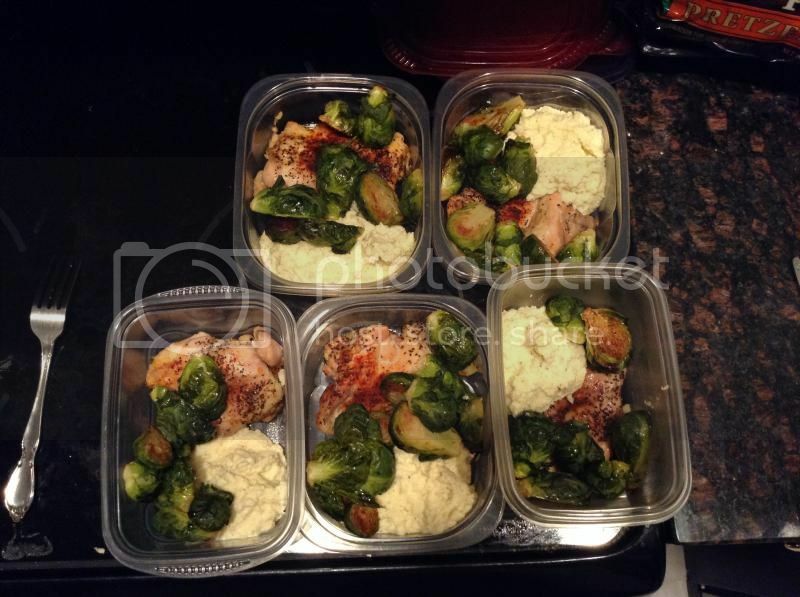 I also made mashed cauliflower and roasted Brussels sprouts. SO good. I love Brussels sprouts so much. One dinner I made the other night (and about a week earlier, because my husband requested it as often as possible) was coconut chicken with mango. 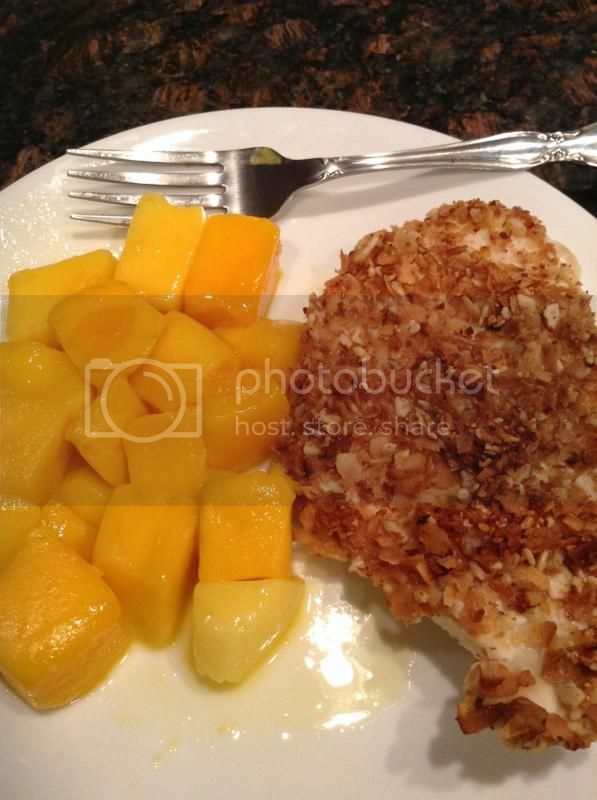 The first time I made it, I marinated the chicken in mango, then toasted compliant coconut flakes and coated them in it. This time, I changed it up a bit - I served the mango on the side, because in my marinade mix, the flavor was lost. I cut the chicken breasts in half the long way to make them thinner. Also, after I toasted the coconut, I put it in the food processor with raw almond slivers and chopped it up finely. Baked at 375º for 25 minutes - super moist and delicious. My workouts have been good - I tried a new machine at the gym called an Adaptive Motion Trainer, which is like a "combination of an elliptical machine, treadmill and a stepper." Holy moley, it is an intense workout! I am usually super sweaty when I am finished - which is never a full hour. Those turkey egg cups sound pretty good. I have seen commercials for that workout machine. It looks awesome. Glad you found one that works for you. Mango salsa became my favorite food ever during my last Whole30. I haven't yet eaten it this time around, but I'm scheming ways to get it inside my mouth. Chicken looks good! Oooh, that's a great recipe! Thanks for sharing! !